A distinctive journal that hearkens back to the days of Noah! [[A gift of elegance and faith[[Beautifully bound with a vintage look and feel[[Filled with poignant quotes and vivid illustrations.This unique notebook is filled with inspirational images and text, all focused on the life and times of Noah, and based on the phenomenal Ark Encounter. Let your journaling experience both honor and lift your faith. 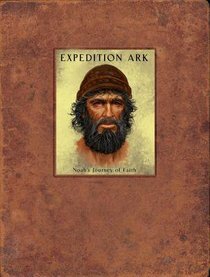 About "Expedition Ark: Noah's Journey of Faith Journal"